Very easy Thursday Authorial today! 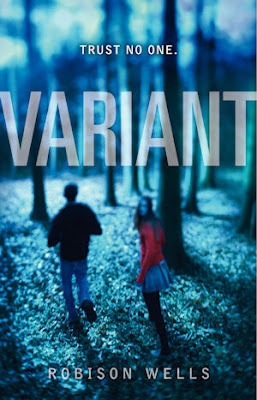 I'm just going to send you on over to my friend Rob's blog for a look at his gorgeous new cover for his soon-to-be-released, available for pre-order, YA dystopian book, VARIANT. Okay, I'm posting the cover here BECAUSE I CAN'T HELP IT, but go look at it and read some more about it on his blog, too. I've had the fortune to read a draft of this book and I can't tell you how perfect this cover is. And the story? Brilliant. Wow, thanks for the blog post! I'm really, really happy with how the cover turned out. Glad you like it to! I can't wait to read this book. And Rob seems just about the nicest guy around. It looks intriguing. Love the cover. Nice to "meet" you on twitter and such. Probably ran into each other at LTUE without knowing it. Rob, I can't wait until its release. It's going to be fun to watch. Mary, Rob seems pretty nice, doesn't he? My favorite nick-name he's given me? Krijerksta. Sweet. Emily, nice to meet you, too. I wasn't at LTUE, but I will be attending Storymakers in May. Maybe I will see you there? I am very excited to read this!